Bling is a new Challenge at Lily Pad Cards, up today. Here is my card ... 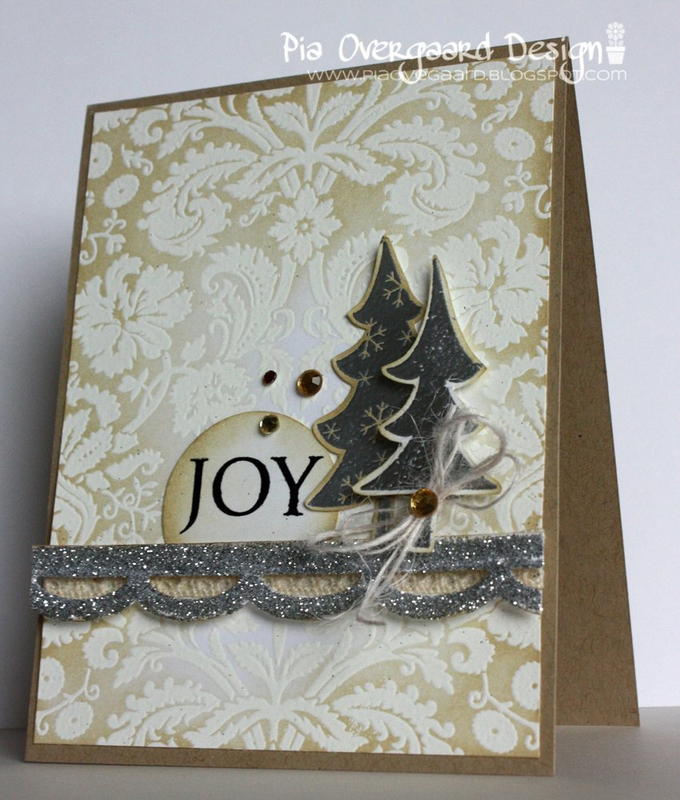 I am actually not really a bling person - so my card is a mixture of natural colors and a bit of bling using some Martha Stewart glitter to cover that die cut border and some silver embossing on the christmas trees. When I was in New York a couple of years ago I bought some glittery letters at the Tinsel Trading Company - they were sort of vintage looking and I was inspired by these when I created the border for this card - distressing the edges & adding that piece of lace behind it. Åh, Pia... det er så super smukt og elegant. Skønne juletrøæer. Beautiful card Pia, I love the sparkly border. This is spectacular, Pia - the glitter adds that very special touch! Thank you for your sweet comment on my blog header and my card! You're always welcome to come to Holland again! Beautiful card and love your idea of glitters on the punch! Oh My! I just saw this over at Lily Pad and had to come over and say how mych I love it! Sooo BEAUTIFUL! Ever so chic! Love the white and antique linen background. Jeg er heller ikke til bling og glitter men her er det flot afstemt til resten! Wow superflot baggrund og lækkert design. Hvordan i alverden får du den embossed baggrund så flot? Oh my! This is absolutely stunning! 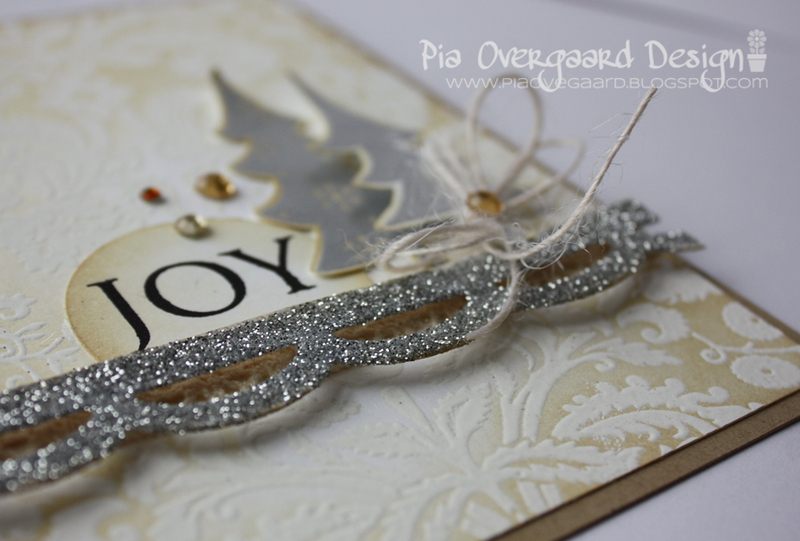 Look at all that glitter on the die cut border, I love it Pia!! Wauw - at skrive det ligner ½ million ville ikke være fair - så jeg går for den hele million =0). WAAAW, Pia. Hvor er det et fantastisk smukt kort. Jeg er heller ikke til bling og glitter men du får det brugt på en flot og afdæmpet måde. Waouw hvor er det kort bare smukt. Dejlige farver og detajer. Wow. Your card totally caught my eye Pia! Love the colours - in fact I love everything about it! love, love, love this lovely card.